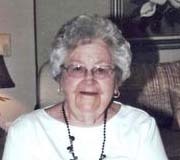 Jottye Espey Newman, age 93, of Stanton, TN, passed away Saturday, October 25, 2014, at Regional Hospital of Jackson, TN. She was a member of Primitive Baptist Church in Bartlett, TN, a devoted wife, a loving daughter, mother, grandmother, and sister. Visitation will be from 12:00 PM until 2:00 PM, Tuesday, October 28, 2014, at Brownsville-Bells Funeral Homes in Brownsville, Tennessee. Funeral services will be at 2:00 PM, Tuesday, October 28, 2014, in the Chapel of Brownsville-Bells Funeral Homes with Elder Kenneth Adams officiating. Interment to follow in Bethlehem Cemetery in Fayette County, TN. Survivors include two sons, Jimmy (Linda) Leath and Danny (Susan) Leath both of Stanton, TN; a daughter, Fay ( William “Sonny”) Howse of Brownsville, TN; her twin sister, Lottye Floyd of Brownsville, TN; eight grandchildren, Berkley Cobb, Julie Cobb, Ashley Newman, Allyson Byrum, Eric Leath, Emile Leath, Kimberly Bishop, and Kriste Morris; and twelve great grandchildren. She was preceded in death by her parents, George Washington Espey and Ara Brown Espey; her husband, Gladston Newman; her daughter, Brenda Leath Cobb; and her sister, Hazel Espey Lilley. Memorials may be given to the Parkinson's Disease Foundation, 1359 Broadway, Suite 1509, New York, NY 10018, or American Diabetes Association, P.O. Box 11454, Alexandria, VA 22312.